Starting in a garage at home Global Crafts has become a $1 million a year outlet for Fair Trade artisan handicrafts. Gifts With Humanity look forward to continued growth in the next few years and hope to be making a small difference in the world. Check back with 58Coupons.com often for the latest coupons, promotions and savings on these beautiful gifts. 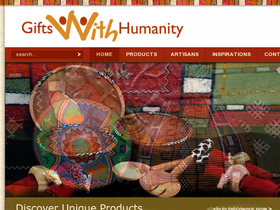 Spend $50+ at GiftswithHumanity.com and you'll qualify for free shipping. Head on over to Gifts with Humanity to save 20% with this coupon code. Click link to see selection. Shop GiftsWithHumanity.com for 15% savings on jewelry. Click link to begin. Not only does 100% fair trade and recycled gifts sound great for your conscience, but you can also get 10% off your purchase with this coupon code.